Gingham glamor is back! This versatile, sturdy, natural fabric is no longer used only in country home decor or worn by country Cowboys. I think its so popular because it blends nostalgia, practicality and style in a way that makes it fun to use. 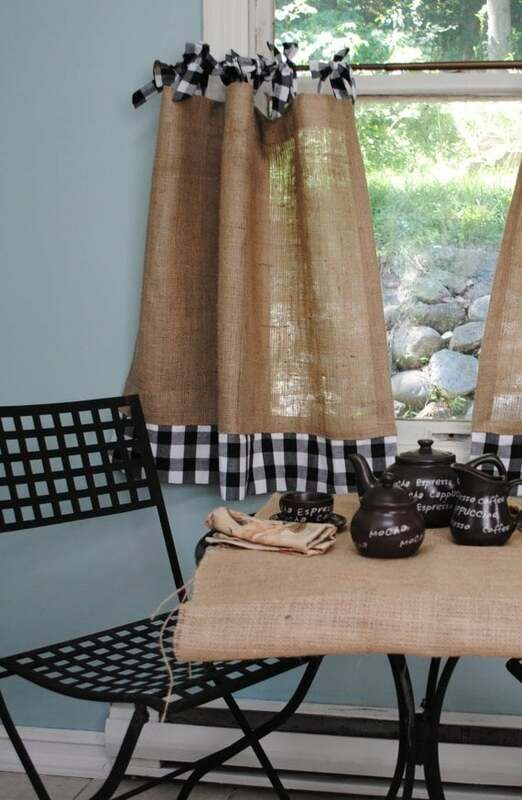 Gingham fabric just works well with many home decorating styles, and adds a little country home decor to any style. Across long stretches of walls, a complete set of dining chairs or small accents. The amount of gingham you use is proportional to your gingham comfort zone. I'm not sure what you think of the new spin on gingham, but I like the way its found its way to monogrammed gingham shoes, nails, gloves and clothes. Large checks, small checks, from every color, straight or on the bias, gingham is a style you can do so much with. Gingham is the most democratic of fabrics. It has no right or wrong side which makes it easy to use. 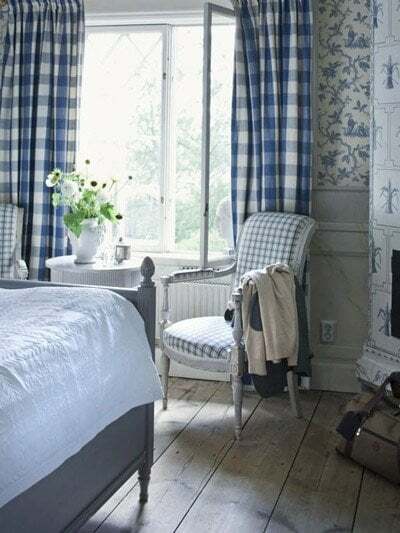 I must admit, the check pattern was never on top of the fabric charts for me... but now I really like the look of gingham fabric and check pattern, whether its to cover walls, windows, or antique chairs. I find even the smallest amount of gingham fabric in a photo frame or cushion can make all the difference to a look. Of course, it depends on the room. But I find that gingham is a great way to layer fabric patterns and add another dimension to home decorating. It gives it depth, as well as color and interest. You can read this article to find out how to use patterns, scale and fabric texture and layer your look. Classic checkerboard was mostly found in primary colors; blue, red, or yellow on a light ground. As it's become more popular, greens, grays and muted browns have been added to the gingham color palette. And they work really well. The size of the check pattern has also changed, which makes mixing and matching much easier. If you want your rooms to look relaxed and subdued, but still classic, add less pattern in primary colors. For a bolder, stronger look, at more primary colors with larger checks. 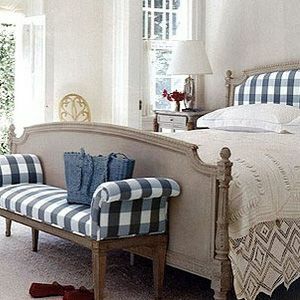 I like gingham added to rooms that are painted white and muted gray. That little bit of pattern and color can break up large slabs of white space. How much gingham glamor you choose is up to you. I like the new ways people are using gingham. 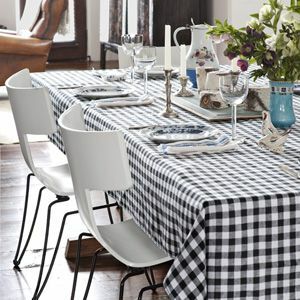 Now you can find the cheeky checks on the cutest kitchen table, with gingham napkins to iPhone covers and lamp shades. Country home decor has gone mainstream. And it doesn't have to be all about fabric. You can paint a check pattern on your floors or walls. 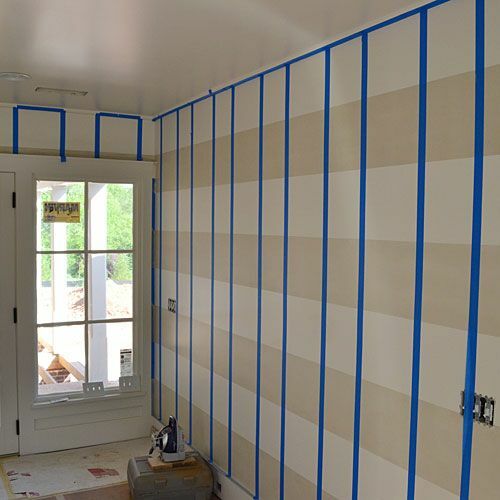 Here is a tutorial from Southern Living on painting a check pattern on walls. I really like the look - it's creative, looks like expensive wall paper and means you only paint one half of the check pattern if you like one of the two colors. Simple, fast home decorating. 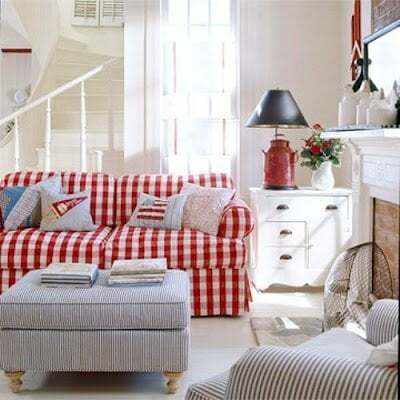 Gingham fabric is a winner on ottomans, sofas and the most ornate French chairs; toning down the any formality but still adding color, texture and a layer of pattern. 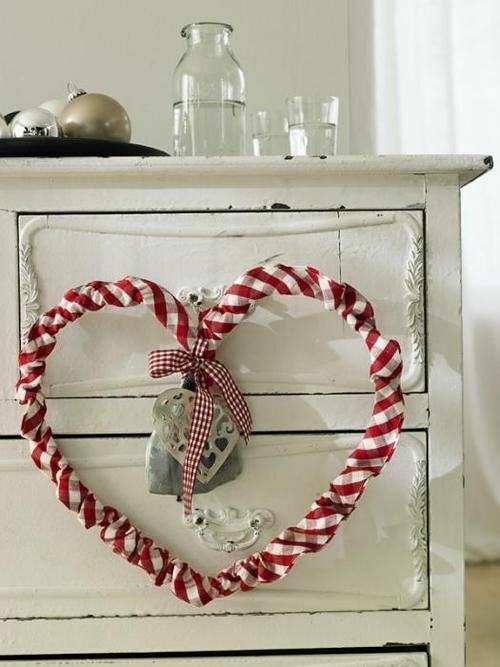 You can create the cutest kitchen table look or move right into the bedroom. The check pattern goes well with primary colors, floral patterns and stripes. Here is gingham glamor in the kitchen, dressing up the best laid afternoon teas. 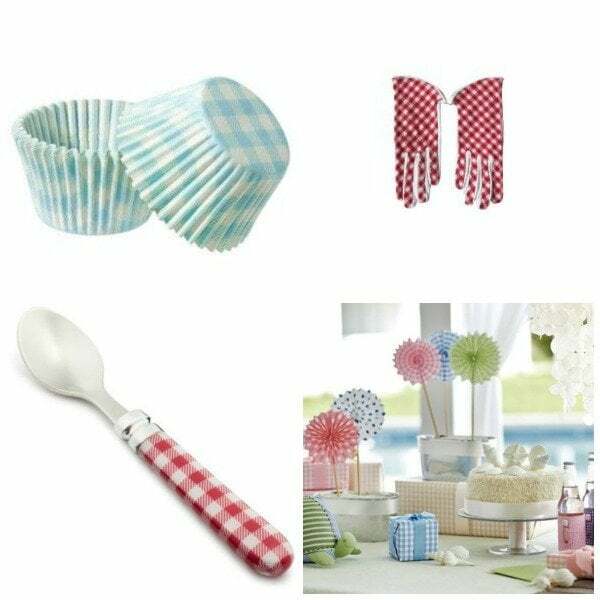 From flatware, aprons and garden gloves, from primary colors to soft pale colors, the check pattern can create the cutest kitchen table setting. 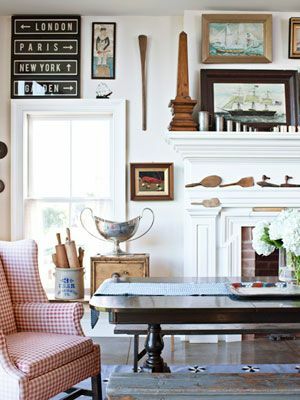 For some, gingham won't give up its homely country home decor past. But move past the country home decor look, mix it in with other home decorating looks, and you get to experience gingham in a whole new way. It's fresh. It's flexible. It's relaxed. And most of the time - it's washable. Think check chair covers, tied to the back of chairs and removed when you want a change. Mix it with burlap curtains. Use it in kitchen valances. Add to neutral colors or outdoor seat cushions. You'll be surprised how stylish this can look. Just the smallest amount of check pattern can make such a difference to your home decorating. 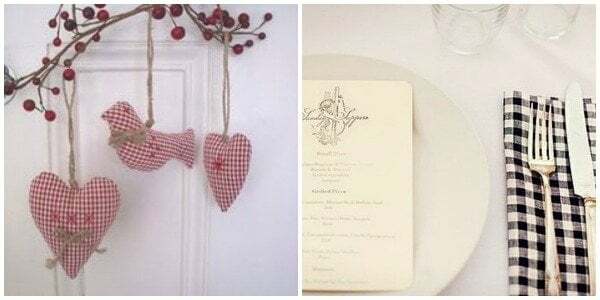 Use gingham ribbon on your gift wrapping, tags, Christmas decorations or table napkins. 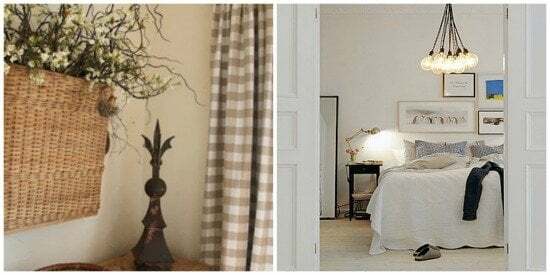 Gingham curtains can look stunning or pillows in a muted, minimalist bedroom. Source: Pinterest and Casa Sugar. If this is your first time using gingham, go small - and I mean amount of gingham, not the size of the check. Add gingham fabric to accessories. 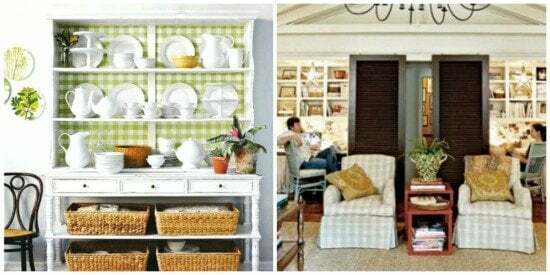 If you are ready for a bolder gingham look, add gingham wallpaper to the back of a bookcase, kitchen cabinet or add some slipcovers to your chairs. 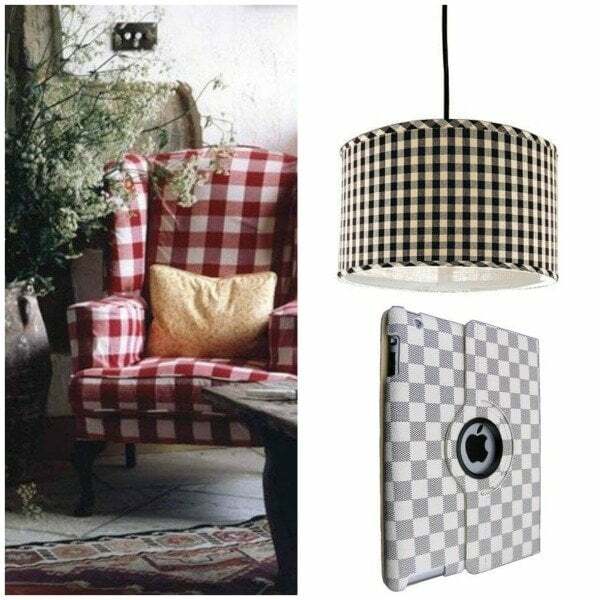 No matter what you choose, remember that a bigger print looks better on furniture and bigger projects, while a smaller gingham print works well on accents or accessories! Here is a video on how to cover a stool with gingham fabric. I'm not sure what my next gingham project will be. But from room dividers to wall treatments, there are some great ways to use gingham. If you would like more home decorating tips, join our email list here.